The Anime Almanac » Blog Archive » Lucky Star letdown and how Bandai’s president just doesn’t get it. Lucky Star letdown and how Bandai’s president just doesn’t get it. Bandai Entertainment held a panel early Sunday morning that I had to attend. 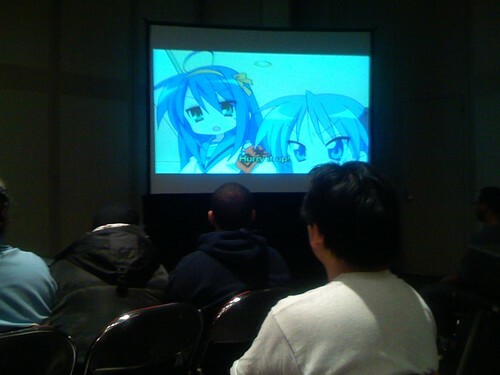 The topic: the US release of Lucky Star. When I walked around the dealers room on Friday, I felt a strange attraction to the Bandai booth. It had become a shrine to “The Melancholy of Haruhi Suzumiya.” A whole table was dedicated to every Haruhi DVD and CD they had to offer. Haruhi posters and banners hung everywhere. And there was even a TV that played the show’s famous ending theme song on a constant loop all weekend. This ensured that a huge group of people remained in front of the booth to show off their otaku dancing ability. But what I really was amazed to see was a huge Lucky Star banner that was hung in parallel with Haruhi’s. Bandai’s announcement of the title was so quiet that I had completely forgot it was coming to the US. I had ask the rep if anything was available yet as far as Lucky Star goes. Oh really? What are you going to be talking about? Lucky Star’s popularity in Japan comes from riding on the coattails of Haruhi Suzumiya, and it seemed to me like Bandai was going to try the same approach to finding success in the US. Not that this would really be a bad idea. Bandai did an amazing job with the American Haruhi release. From a great online marketing campaign to special editions DVDs that made my Japanese friends envy, I do not have any complaints on how well they treated it. So I could only imagine what they would have in store for Lucky Star. For example, something like the English voice actors doing a series of “Lucky Channel” sketches would be really funny. I got up extra early that Sunday to catch the bus into the city. I might have got a bit too early, because I ended up waited in the panel room for close to an hour. The crowd that eventually showed up was very small. The panel was added at the last minute, so it didn’t appear in the convention’s program. Also, it was Sunday morning, so who would want to wake up that early? Besides for me, of course, and about 20 or so other dedicated Lucky Star fans. When the panelist arrived, they started off with a fun Karaoke contest of Haruhi’s opening theme song. Afterwards, the audience demanded to do the ending theme song. The team obliged and many people in the audience got up to dance with the song. They weren’t able to play the Lucky Star theme song, but they did follow up with a hilarious “blooper” reel of some great ad libbing for the Haruhi Suzumiya dub. Bandai’s big announcement on how they were going handle the release of Lucky Star was the exact same thing the rep had told me two days earlier. “We’re going to do something similar to what we did with Haruhi.” What exactly did that mean? They couldn’t say. Online video campaign? Not sure. What would be coming with the DVDs? Not sure. I think what Bandai really thought was going to be the big news was the announcement of the dub cast. They had a guessing game of hearing the dub voices, guessing who the actress was, and then hearing the actress reveal the answer while still in character. 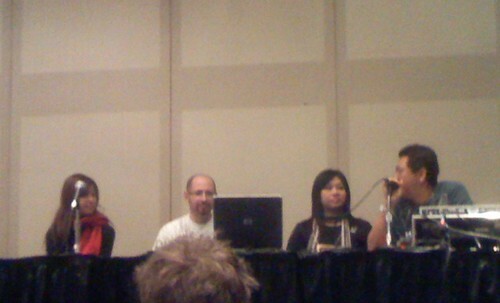 You can tell that they had recorded these sound clips specifically for this panel, as the voice actresses made remarks about the NYAF in these clips. But the game was a disaster because no one in the small audience seemed to be able to identify or even care about American voice actors. Disappointment was high in the crowd as they opened up the panel to Q&A. One person was able to squeeze out some useful information from Bandai when they asked the reps “On what side do you start to eat a chocolate cornet?” They laughed, but then admitted that a chocolate cornet might be included in the first DVD. I’m not sure if they meant an edible cornet or not, but it was nice for them to tell us something about the release. Then they called on yours truly for what I thought was going to generate a real thought-provoking response. The answer I was looking for was for them to admit that the internet was actually a great tool for anime marketing. I thought they had came to that conclusion with the video campaign they did for Haruhi. People had already seen the show and loved it, so Bandai chose to reach out to that audience and ask them to further support the show. After seeing the shrine of Haruhi at the Bandai booth, it would appear to have been a huge success for them. Bandai’s President Ken Iyadomi got on the mic to answer my question. That was it, next question. No further details. No acknowledgments on successfully reaching out to the fansub community. Mr. Iyadomi was clearly ignorant of the fact that everyone in that audience was part of the fansub community. They had all seen Lucky Star already. They already know the characters, so they don’t really care about English voice actors. They already know the jokes, so they asked the panelists that cornet joke. They already know the Lucky Star dance, so they begged Bandai to play the song so they can all do it. But this all means that they already know that they love the series. They love it so much that they would wake up early on a Sunday morning to find out what the future holds for it. If they didn’t care about that, they wouldn’t be there. The crowd was small, but every single one of these people represented the future of Lucky Star in America. How could he ignore this? We are not really that enthusiastic about the new DVD formats. They are not region coded, so we foresee problems with releasing titles in both Japan and America. An anime DVD releases in Japan for $50. A year later, that same DVD releases in America for only $25. The Japanese fan will clearly wait a year to import the American DVD at a much cheaper price. Mr. Iyadomi clearly doesn’t get it. Because it is a niche market that comes imported overseas, the American anime industry must rely on the latest technology in order to exist. It starts with the small VHS market in the 90′s. It explodes with the bilingual DVD market at the turn of the century. And its future is in the openness of the internet and new digital media. This is already clearly evident within the underground fansub community, and if Iyadomi doesn’t wise up to this idea soon, he’s going to get left behind. I will finish up my series from the NYAF next week with this topic and how other companies are already preparing for the internet revolution of anime in America. Okay, this post is still creating a lot of buzz even weeks after I posted it. Let me just clarify a couple of misconceptions and mistakes I’ve been seeing. Lucky Star is not ruined in the US – Just because Mr. Iyadomi doesn’t get it doesn’t mean that Bandai’s marketing department won’t pull through with an awesome release. These are the folks that did Haruhi, after all. I’m sure that we are all going to satisfied with it. My “letdown” was how little they had to say about the release at NYAF. Blu Ray is region code- But Japan and the US fall into the same region, so it doesn’t really matter. A release in America after one year is not common- But Bandai’s US release of Haruhi, Lucky Star, and the Girl Who Jumped Through Time are close to a year after the Japanese release. It looks like they turning to faster US releases these days. I also changed the formating of the quote to better show that it is my paraphrase and not a direct quote. This entry was posted on Wednesday, January 9th, 2008 at 7:10 pm by Scott	.